(1) Study members with greater lead exposure in childhood tended to endorse more psychiatric symptoms when assessed for psychiatric disorders in adulthood (between 18 and 38 years of age). These individuals tended to report more internalizing (e.g., depression, anxiety) and thought disorder (e.g., OCD, schizophrenia, mania) symptoms. Compared to other findings from this sample, the associations reported in this article are similar to those reported for lead and IQ, and are stronger than those reported for lead and criminal offending. Informants who knew Study members well reported higher levels of difficult adult personality traits among Study members with greater lead exposure in childhood. Specifically, Study members with greater blood lead levels at age 11 were rated as more neurotic, less agreeable, and less conscientious by 38 years of age. Psychiatric problems related to lead exposure could be detected as early as 11 years of age. In the 1980’s, parents and teachers of children with higher blood-lead levels had described them as displaying more antisocial behavior, hyperactivity, and negative emotions (e.g., sadness, anxiety). MedicalResearch.com: Why are these findings important? (1) Lead exposure is known to harm child behavioral development. We have now found that this harm persists into adulthood and may raise the lifelong risk of mental illness. (3) While lead exposure may not be a major etiological factor in adult psychiatric disease today, past exposures from the era of leaded-gasoline could have resulted in a greater burden of psychiatric disease at the population level. (4) Adults today who were previously exposed to lead may benefit from increased screening and access to mental health services. Response: The implications for the larger health system are: follow-up in children exposed to lead should include mental health services and, furthermore, should focus on potential long-term persistence of changes to behavior, emotion, and interpersonal relations. For clinicians: adult patients with a history of childhood lead exposure may benefit from mental health screening and services. For countries and communities where lead exposures are still above recommended levels: our study adds to the large and growing lists of reasons why removing lead from the environment is an important public health goal. Consequences of childhood lead exposure are, we now know, greater than we used to believe and appear to persist, at least to midlife. 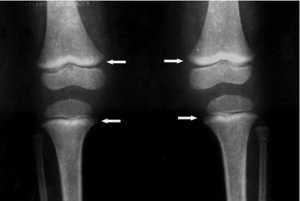 From CDC:Long Bone Radiograph of Knees – “lead lines” in three-year old girl with BLL of 0.6 µg/dL. Notice the increased density on the metaphysis growth plate of the knee, especially in the femur (Photo courtesy of Dr. Celsa López, Clinical Epidemiologic Research Unit, IMSS, Torreón, México). Response: One thing we are hoping to evaluate more in the future is the extent to which lead stored in the bone (which has a half-life of many years to many decades) may re-circulate as individuals age (such as during menopause and osteoporosis) and may then lead to greater acute exposures. We know this can happen, but we do not know to what extent it can be large enough to contribute to new problems in life. If so, nutritional supplementation to prevent bone loss could, hypothetically, improve health outcomes. But that is still speculative. This entry was posted in Author Interviews, Duke, JAMA, Mental Health Research, Pediatrics, Toxin Research and tagged aaronreuben, JAMAPsych, lead exposure, mental health, pediatrics by Marie Benz MD FAAD. Bookmark the permalink.